Canola is good for bees, and bees are good for canola. Together, they are good for the health of our ecosystem and our economy. The Canola Council of Canada (CCC) and the Canadian Honey Council are working together to maintain this mutually beneficial relationship. The CCC is also a partner in Bees Matter (beesmatter.ca), an initiative to restate agriculture’s commitment to honey bees and bring knowledge to the Canadian public. Canola is an ideal habitat and food source for honeybees. Canola flowers produce high amounts of nectar and this nectar has a good sugar profile for honey production. The large amounts of pollen offer a good nutritional balance of amino acids, protein and fats. Plentiful canola blooms allow bees to feed efficiently, without covering large distances. Canola fields bloom for relatively long periods, so one field can provide bees with a good source of nectar for up to a month. Bees can have a positive impact on canola production. Pollinators are needed for production of quality hybrid seed – a vital component of the industry. Research suggests pollination by bees may also encourage higher yields, promote more uniform flowering and earlier pod setting, and increase pods per plant, seeds per pod and seed weight. In the past decade, the number of honeybees in Canada has reached near-record levels and more than 70 per cent of colonies are in Western Canada, where canola has become one of the most important crops. Canola growers can protect bees by sharing pest management plans with honey producers in the area. With this information, beekeepers can then reduce exposure by moving or covering their hives during spray applications. The next step is to avoid spraying when canola is in flower. 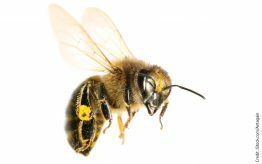 If canola growers must spray while canola is in flower, pay extra attention to the following precautions: Spray after 8 p.m., by which time most bees have returned to the hive. Certainly avoid spraying between 10 a.m. and 4 p.m. Use economic thresholds and integrated pest management. For more details, read “Protecting bees when growing canola” at canolacouncil.org. For videos, search “canola and bees” at vimeo.com.